I’m sure you know this feeling. You study your new language at home, or in class, and it all seems to be going well. But then you go out into the real world, speak to some people… and you understand nothing. It feels like you’ve gone back to square one. It’s frustrating. And demotivating as hell. The problem is, of course, that when you’re listening to native speakers it’s all too damn fast! If only life came with a “rewind button”! Technology has always had the potential to help with this problem, but I’ve always found most online tools to be a waste of time. But it’s precisely because they try to sidestep the hard work that they end up being all but useless. The good ones out there understand the hard work that the learner needs to go through. Rather than trying to eliminate the hard work, they support them and give them what they need to do it. Three that I particularly like are LingQ, BliuBliu, and Yabla. But there’s one that I’ve recently fallen in love with. One that genuinely works (…really). One that gives me exactly what I want. FluentU… My cup of tea! I was drawn to FluentU primarily because I was looking for good content to read and listen to Japanese. When I lived in Japan, I would often watch things on TV and be overwhelmed with vocabulary that I didn’t know, or just by the speed of it all. You can genuinely waste a lot of time watching foreign language movies and TV. I would wish that I could just slow it down, have someone explain to me what they were saying, maybe watch it a few times over. But that would have been too good to be true. So I’d go back to my books and study a load more unrelated stuff, usually some dull reading passage about tea ceremonies or Children’s Day. Given this particular problem, it almost feels like FluentU was designed with me in mind. 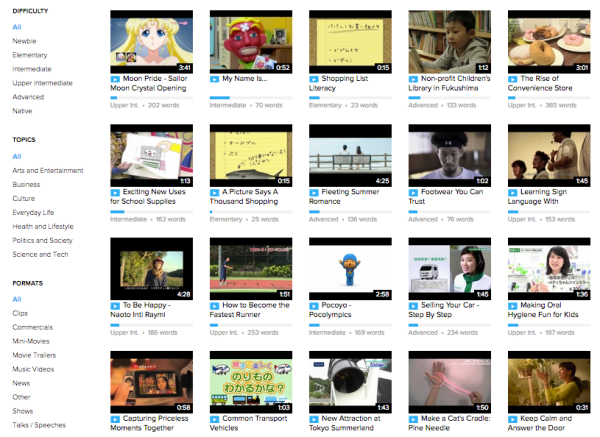 Imagine my delight, when I found hundreds of Japanese videos (taken from YouTube), complete with bilingual subtitles, hover dictionary and integrated SRS flashcards! Surely it’s too good to be true? First, there’s the video library itself. The major feature of the FluentU system is that all the foreign language videos have been painstakingly transcribed, translated and subtitled. This, in effect, is the substance of what you’re paying for. Once you select a video to watch, it opens in a nicely designed, minimalist “console” for viewing and study. As you can see, there are three layers of subtitles for this video in Japanese – the kanji, the furigana (phonetic pronunciation of the kanji) and the English. 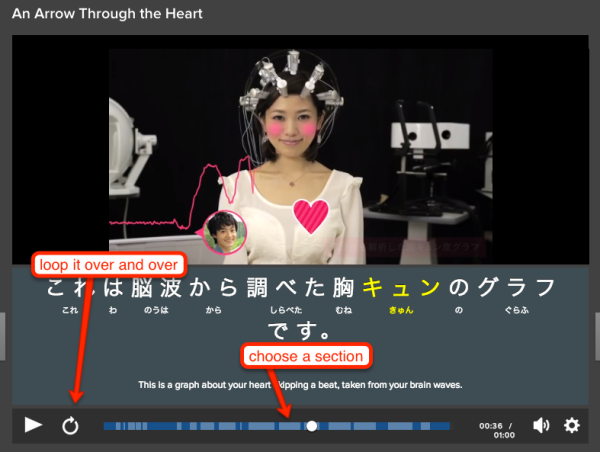 You can control each of these kinds of subtitles and turn them on and off individually, which allows you to be intelligent about your studying and approach the videos and texts in a way that suits you best. For example, with any new dialogue or audio, I like to train my ear by listening many times over without any text or subtitles. One of the problems with trying to learn languages from movies and books is that if there’s a word you don’t know, you have to pause and reach for the dictionary to look it up. This is cumbersome and really slows you down. One of my favourite features of FluentU is the “hover dictionary”. 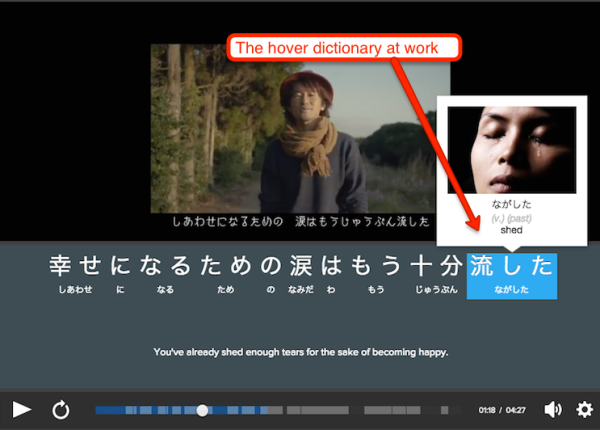 Every single word in every single video is linked to a dictionary, and all you have to do is move the mouse over a word and it will instantly give you the translation. As an independent learner, you have to use this feature with a bit of discretion, because always looking up every unknown word instantly is not a very smart way of learning. However, as I said before, good technology needs to support you in your learning and give you what you need. This does the job very well. As you’re watching, the video segments (which you can see in the grey/blue bar at the bottom) can be selected individually so you can easily skip back and forth between certain bits of the video. The best part of this, though, is that when you get to a hard part of the video, you can click the “loop” button to loop the section you’re watching over and over. This is excellent for deciphering difficult pronunciation or just getting used to the way a phrase sounds. Firstly, listen many times with no subtitles. Don’t worry if there’s lots to understand, just aim to get used to the sound of the words and pick up as much as you can from the context given by the video. Add the subtitles in the target language only, and watch again many times. Here’s where you start to fill in some of the gaps that you couldn’t get from the audio alone. 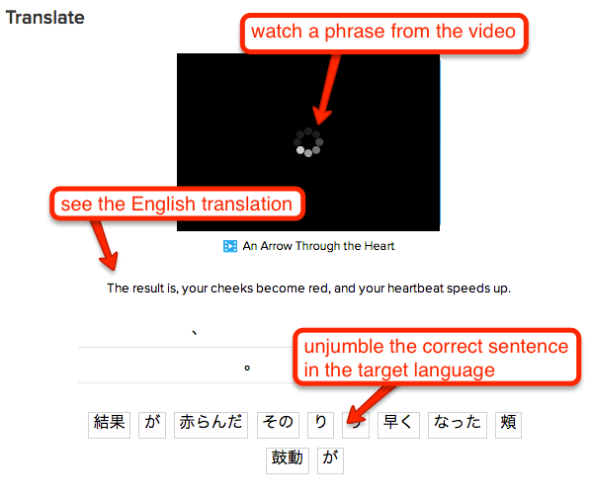 Again, don’t worry if there are things you don’t understand, use the subtitles to help you, and stop and start the video as often as you need to try and pick things up, using the “Loop” function to really drill down into detail on the difficult bits. Finally, when you feel that you just can’t squeeze any more juice out of it, add the English. As before, watch and listen many times. The aim is to get used to everything in the video and be able to understand it without too much strain. People often have trouble knowing what to do with all the vocabulary they learn from studying. After all, writing a new word down in your notebook does not mean you’ve learnt it. they do a bad job of it, committing the cardinal sin of showing you endless single words, single Chinese characters, or whatever, out of context! The guys at FluentU have learnt from others’ mistakes, though, and done it properly… just the way I like it, in fact! Their system extracts all the vocabulary from the videos into their own built-in spaced repetition tool, which you can then use to review it later. If you’re familiar with memrise.com, you’ll doubtless notice the similarities in its functionality. The main reason I love it is because it always keeps all of the vocabulary in full sentences, which is one of the most vital parts of learning vocabulary well. 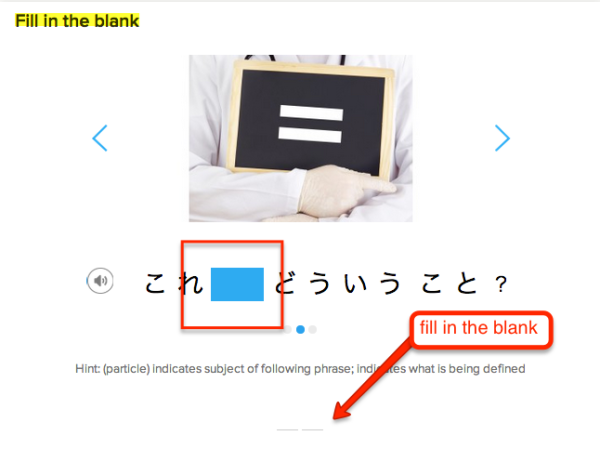 The fact that you get to see the relevant video clip or picture along with the sentence is great for visual learners, although unfortunately there are still bugs with the audio and video within the flashcard system, and I often couldn’t get it to work properly. As much as I think it’s great, I do occasionally grow frustrated with the Memrise-style system (I find it too indirect), and head back to the safety and comfort of my two-sided flashcards. However, just as I was thinking smugly to myself that I’d identified a flaw with FluentU, the team emailed me to say that they were going to introduce standard flashcards into the learning system. At the time of writing I don’t think it’s quite ready, but that will be great when it’s ready. Although when I signed up I was initially interested mostly in the videos themselves, I found myself using the flashcard centre much more, because it’s so well integrated with what you watch in the video. What’s even better is that there’s integration in between what you’ve been studying in the learning centre and what you see when you go back to watch the video again. This integration in-between the videos and flashcards really is fantastic, and it all contributes to that vital goal of supporting you as a learner, rather than trying to create an ecosystem which dictates how you should study and gamifies the whole process – something that drives me crazy! Surely It's Not All Good? Throughout the month that I’ve spent testing FluentU, I’ve been thinking about the review that I was going to write, and wondering what the negatives were that I’d need to point out in order to keep it balanced. After all, this is a paid tool (pricing starts at $8 a month), and a review wouldn’t be a review without an honest appraisal of the drawbacks or limitations, right? However, as the weeks went by, and perhaps for the first time in my life, I have actually struggled to find any negatives whatsoever. …but I honestly didn’t care about these things one bit, and spending any time discussing them would be missing the point. 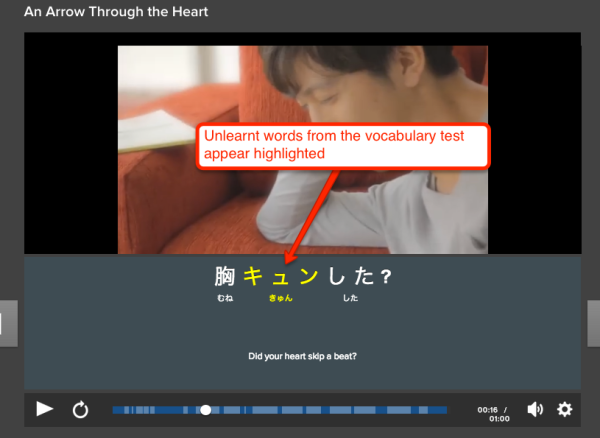 The core experience of learning a language with engaging video, being able to identify, manipulate and decode every single word, and then review it all automatically with specially designed flashcards has been… sensational! One other thing that I've been very impressed by is the dedication of the team behind FluentU to making the the website as good as it can be. I've been in touch with Alan and Claire in the product team quite a bit over the last few weeks, discussing the site and talking about improvements. At first I was surprised by how much time they take on a day-to-day basis to talk to customers and solicit feedback. But now it makes a lot of sense. That's how you make a product that works – listen to the customers and care about how they're getting on. There are a whole host of improvements and upgrades to the site on the way, so it'll be great to see how it evolves over time. My hat goes off to them. As I said at the top, my Japanese has been floundering for a couple of years as I’ve struggled to find good content that’s both interesting and accessible in order to stay motivated. How long will this excitement last? Can I believe I’m giving a language learning website such a glowing review? Seriously… check them out: FluentU. 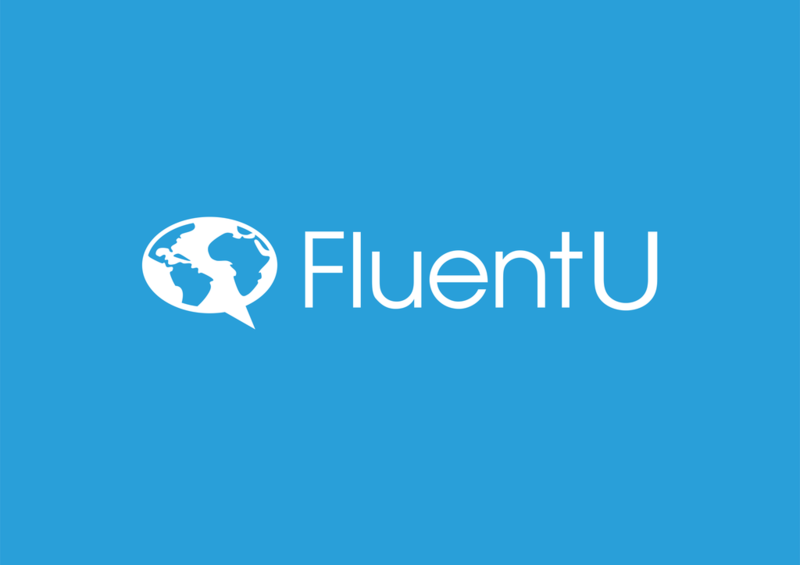 Have you used FluentU? What do you think? Have any other favourite websites? Leave me a comment below.